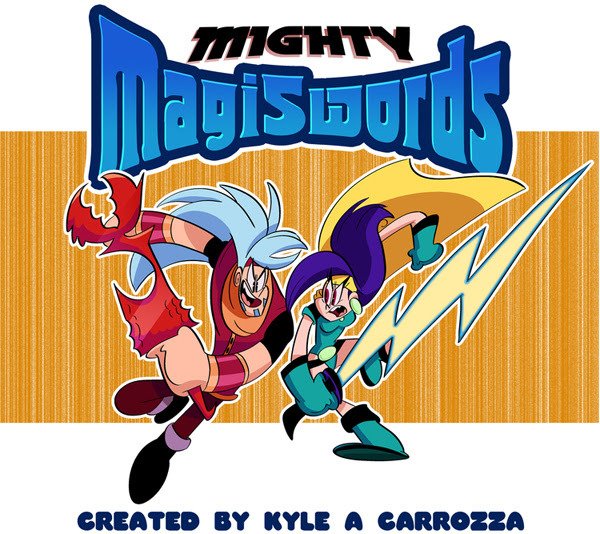 “Mighty Magiswords”: From Kyle Carrozza comes Cartoon Network Studios first original digital series about a brother and sister team of “Warriors for Hire,” who go on hilarious adventures and crazy quests to collect magical swords. Meet Prohyas and Vambre, the “Warriors For Hire”! Kyle and his crew at CN have already created content which will be released later this year, and they have just begun working on what will officially be Season One of “Mighty Magiswords” this week, to debut before the end of 2015. Back in November 2014, Kyle was asked by his superiors at CN who he’d like to have writing episodes of “Mighty Magiswords”, and one of the people Kyle told them he wanted was me. Having seen the MM content created up til then when Sara and I went to L.A. for Kyle & Lindsay’s wedding, I was very excited and chock full of potential story ideas. I shared about 20 ideas with Kyle, he narrowed it down to 5, and I had some phone meetings with his boss at CN, who liked my ideas, and picked out the one he liked best to eventually develop into an episode of the show. Contracts were exchanged and signed, and since then I have been waiting for things to get to the point where it’s time for me to take the next step in the writing and development process for that potential episode. Of course, I not only can write funny things, I can also draw funny things, and Kyle wanted to see what I could do in regards to contributing to the show beyond writing potential episodes from my home in Chicagoland. So about that same time, Kyle gave me an assignment. He wanted me to write and storyboard a short scene, just the beginning of a story where the “Warriors For Hire” get hired to do a task by someone, end of scene. I misunderstood his instructions. I thought he wanted me to write and storyboard an entire story of the Warriors getting hired and then going on and completing their mission. I came up with a whole new story (which I hadn’t pitched to Kyle in the previous batch of ideas) and drew 200 panels with detailed notes. Then, being the overachiever that I am and wanting to impress Kyle, I recorded myself reading all the lines in character, added sound effects and some rudimentary music, scanned all the images, and edited together a rough video animatic of the story, to better get across the timing and delivery of the jokes. I emailed the MP4 of the animatic and a PDF of the 67 page storyboard to Kyle. His response was, “Luke, you incredible weirdo”. Again, the point of this extra effort was to impress Kyle. Well, apparently it worked, because before the day was over, Kyle showed this ‘practice’ storyboard/rough animatic to his bosses at Cartoon Network. And they liked it. A lot. So much so, that over the months that followed, my name was being brought up frequently in their discussions of forming the MM production team. So to recap, I impressed the Hell out of some creative executives at Cartoon Network as a byproduct of misinterpreting Kyle’s practice storyboard instructions. Kyle likes to call this story “Luke Fails Upward”. The end result of all this, and of Kyle’s unwavering support and belief in my abilities as a writer and cartoonist is as follows: I have been offered a position as a Storyboard Revisionist on the staff of “Mighty Magiswords” Season One at Cartoon Network in Burbank, California. What this job entails is me taking existing storyboards, referring to the network’s notes made on those storyboards, and making changes based on those notes. There are other skills I will be learning there as well, but that’s the main part of what I’ll be doing. 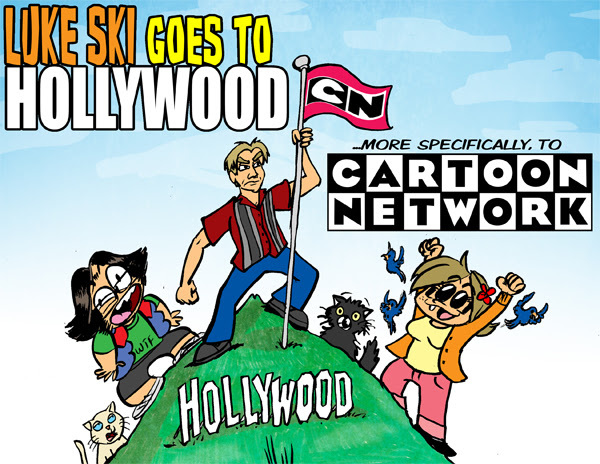 I, LUKE SIENKOWSKI, AM GOING TO WORK AT CARTOON NETWORK. On Tuesday, March 24th, I will climb into my new vehicle, a 2014 Nissan Versa Note SV, and make the 3 day drive out to Burbank, CA. I start work on Monday, March 30th. I will spend the following 4 to 6 months living on Kyle & Lindsay’s couch, going to work 5 days a week at Cartoon Network with them (yes, Lindsay is on the staff too, as a character designer). I may end up trying to find my own place to live once I start getting paid. Aside from being a Storyboard Revisionist and Writer on “Mighty Magiswords”, I am also hoping to break into doing voice work for animation. Those of you who know me (or at least have heard my song “Neurotica”) can undoubtedly deduce that internally I am freaking out about all of this, from both the positive and negative sides of things. I don’t want to be away from my awesome wife Sara, “my favorite part”, for months on end. I’m going to miss Carrie, Alex, and all my Chicago friends so much. And I really don’t like the idea of not having my Mom and my siblings within a day’s car drive from me. Despite all of that, there’s no way in Hell I’m not going to do this. A long time ago, I made myself a promise. My whole childhood and adolescence, my biggest dream was to someday work in comedy animation. A kid or teenager doesn’t spend hours upon end for multiple days during the summer making animated movies with his mother’s 8mm film camera on a whim. That kid is ambitious and determined to make his dreams come true. I went to a fine arts college because they told me they would teach me what I needed to make that a reality. They lied. About the same time their bait-and-switch had fully sunk in on me, I was given the gift of being alerted to the existence of “The Dr. Demento Show” on the local Kansas City airwaves. With that, much like the urban legends surrounding Walt Disney, I cryogenically froze my dreams of working in comedy animation, and turned my laser focus to a new goal: create comedy songs of a high enough quality that I might get one played on “The Dr. Demento Show” once. If any of you reading this don’t know how that venture turned out for me, well, go read my bio page at the FuMP. So here I am, 20 years later, thawing out a dream that I never thought would become real. I get to be part of a team creating an awesome hilarious cartoon show that will be seen by thousands all over the world. And if things go well, I might get to continue doing it, for years to come. And get paid for it too. I want to thank Sara for telling me back in October that I should ask Kyle if there would be any openings I could apply for on his show, and for being the most loving, supportive, understanding wife ever. I want to thank Kyle & Lindsay for when I asked them about it, responding with ‘we were already going to insist that you do, and let you live on our couch’. And I want to thank the powers that be at Cartoon Network who are taking a chance on me based on Kyle’s word and the stuff I’ve submitted to them so far (both on purpose and accidentally). So there you have it folks. I’m going to “Hollywood”. Maybe if I’m lucky I’ll run into Orson Welles and he’ll give me one of those standard ‘rich and famous’ contracts I’ve heard so much about in the movies. Until then, I will be happy to help Kyle Carrozza make the awesomest funniest show this side of a mouse-click, and look forward to the day I can be with Sara and all my Midwest family and friends again. Thanks for reading, and I hope to see you all with me & TV’s Kyle at FuMPFeST 2015. Posted in Uncategorized on March 13, 2015 by LukeSki. That's awesome. Congrats, Luke Ski!